conservatives in the long grass for george and bertie? Should the Government withdraw US President George Bush's invitation to visit Ireland in June? Legal Mandate to Invade Iraq? Law, including international law, is the formalization of the rule of the powerful. While we should expose the hypocricy of those who make the laws but don't obey them, we should do it in a way to undermine respect for law among the oppressed, not strengthen it! 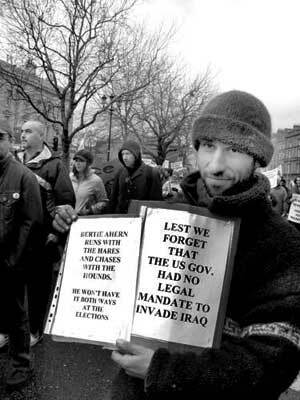 while all of the above may be true - the US/UK did not have a legal mandate to invade Iraq. simple as that. Hypocrisy and UN is an old story - the UN is not a world government and has no more of the powers that the security council gives it. Historically, it has never become more than the sum of its parts. International Law is a good place to start if you want to create a just and orderly world, Bush and Blair's war will either destroy the concept of international law or perhaps, in reaction to Bush and Blair's illegalities, give it new life. This is the global question for this era.